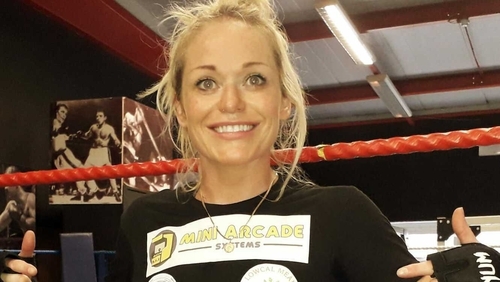 Lynn Harvey may have already turned 30 before boxing "found her", but now the Dublin fighter is one win away from becoming European champion, so in essence, it was well worth the wait. A self-confessed party girl throughout her teenage years and well into her twenties, the Kilbarrack native barely put a foot through the door of a gym inside her first three decades, but that would all change. Change utterly. Even, as it happens, the prompting of a fortune teller failed to set the inevitable in motion. "I got the head thumped off me," recalls The Hunter as she is known inside the ring, as she ponders all the way back to her first time lacing up the gloves up and competing inside the ring. A chance visit to a boxercise class in the local Trinity gym "to lose a bit of weight and tone up", Harvey spotted some amateur enthusiasts getting put through their paces in a sparring session. The group were immersed in a training camp for a white collar boxing night. "I had never had a pair of gloves on me or I had never boxed but there was a white collar show three weeks’ later, so I asked could I be on that. Naturally, Harvey took a hiding with just a few weeks to learn the noble art of hitting while not getting hit. "But I came back and joined the boxing club and got my card. "Within a year I was the novice all-Ireland champion, year two I was intermediate all-Ireland champion and in year three I was Elite champion." A remarkable feat for a mere novice, competing at the highest level in the country, without any sporting experience to draw on before taking to the pugilist profession. Doors opened for Harvey, but representing Ireland or dreaming of Olympic Games and World Championships were not in keeping with the main reason that the northsider had put her heart and soul into her new-found passion. "I was asked to join the Irish team to go away and fight but I turned it down. I had no interest taking a spot on the team. "Boxing was a personal challenge for me and when I won, I was happy with it." Harvey was winning inside the ring, and as a result, she found that she was also starting to gain the upper hand on a much bigger battle that had presented itself throughout her twenties, and getting progressively worse once she passed the big 3.0. "I wouldn’t want to be going away and putting on a vest, representing the country, because I’m probably fighting for a more selfish reason, for myself. "I’ve suffered a lot with depression in the past and a lot with anxiety. "Around the time I started boxing, it had got really bad and I honestly believe that boxing was sent to me, because it had been getting progressively worse through my late twenties and coming up to 30, my depressive episodes were getting really extreme – extreme highs and lows. "I wasn’t going in the right direction and I don’t know which way I would have gone if boxing hadn’t come along. "A few months before, I had been to a fortune teller and nothing she said made sense. I was there for over an hour and she kept pulling the same card and she told me that I was going to box. "I said ‘I’ve never even been in a gym’ but she kept saying, you are going to box and you are going to do really well, moving in all the higher circles. "I forgot all about it as it made no sense to me at the time. It was only way after that I started thinking about it." No longer competing as an amateur, Harvey took some time away from the ring, while maintaining her fitness throughout the boxing sabbatical. But her will to fight never left and inevitably, she decided to dip her toe in the paid ranks of the sport. Harvey made her professional debut in November 2015 on a boxing card at Dublin’s Red Cow Inn, defeating Ivana Yaneva, by a technical knock-out. Twelve months would pass before she had a chance to build on her maiden victory, however, her only defeat would come by way of a points loss. Harvey has won all four fights since the loss to Mary Romero, three by way of knock-out, while her victory over Sara Regina Coca came as a result of a bizarre disqualification, as her opponent aimed a kick-boxing style strike into her midriff. An act of mental fatigue rather than malice, no doubt, Harvey also learned a lot about her own abilities inside the ring that night as she managed to combine the ideal mix of fighting toe-to-toe, while also working on the outside. "When I was as an amateur, I was more of a fighter than a boxer," explains Harvey. "But in that fight with the girl who kicked me, I was getting clipped a lot on the inside as we were fighting. "And while I was clipping her as well, I adapted and I stood back and boxed at length and I absolutely dominated the fight after that. "So I can do either." So on to Saturday’s European title shot against Catalina Diaz, as the two women go to war for the vacant EBU European Female Minimumweight title. "I’ve watched a couple of her fights but there is nothing that I have seen that I am intimidated by. I’m a better boxer, I have more skill. She’s 4ft 11inches and I’m 5ft 1in - I know I’m tiny but I’m bigger than her. "I’m really confident without being complacent. I know she’s tough but I am prepared for 10 rounds. "I’ll just figure out what to do when I am in there. I’m confident I can box her at length or on the inside. Plans go out the window, so I just trust that I can adapt when I’m in the ring and do what my coach says." Harvey is surrounded by a wealth of experience, training under the guidance of coach Reg Byrne, while her trusty cutman Niall Byrne will also travel to Spain for this weekend’s fight. And Harvey has also worked with John Connor, who supervised her weight cut throughout camp, while sessions with renowned sports psychologist, Alan Heary, have also proved most beneficial. The very well connected boxer Jay Byrne has been working as Harvey’s manager, while KO Media will also travel for the European decider, documenting the occasion. And camp could not have gone any better for Harvey, who believes she could not have prepared any better, even if it was for a world title bout. "It’s the toughest but best camp that I have had to date. There is literally nothing more that I could do, even if I was fighting for a world title. "The sparring, the pads, the footwork, I have been taking supplements and talking to a sports psychologist. There is nothing more that I can do going over there." Harvey has generally fought at around the 50kg light-flyweight division, however, she must get down to the requisite 47.6kg to make the Minimumweight mark for Saturday’s title fight. "I’m getting older and this will be the lightest I have ever been in my adult life. It’s a bit extreme but I will do whatever I have to do"
A process that has been worked on throughout camp so as not to have to resort to extreme measures in the days and hours before the weight in. And Havery feels that she has not lost any of her power or stamina despite going through camp on limited calories. "I’m getting older and this will be the lightest I have ever been in my adult life. It’s a bit extreme but I will do whatever I have to do. "I’ve been dropping weight throughout camp so that I wasn’t left with too much of a mountain to climb on the last week. "Camp is hard enough, but doing it on limited calories is even harder. But camp has gone brilliantly, I’ve been sparring well and the energy is good. "I’m looking forward to getting the job done because at this stage, I’m hallucinating about food." Harvey is in no doubt that the European belt is coming home with her on the flight back from Spain – and this time without the help of a gypsy lady with a crystal ball. "I have already seen it. Even before I was told about this fight, I’ve had that belt printed out and on my wall for over a year and I have it as a screen saver on my phone - Lynn Harvey European champion. "I am not even contemplating losing. I feel the universe is working with me. "I’d have to be put asleep to not get it. This girl has never stopped anyone and no one has ever stopped me." Harvey may well return from Madrid as European champion, but while she has visualised the victory, the now 38-year-old is loathe to look beyond it, with doors, no doubt, opening towards world title and lucrative fights. And should she secure the European belt on Saturday, it will be up to manager Byrne to work his connections, which include renowned promoter Eddie Hearn, to perhaps fast-track Harvey towards a shot at world glory. "I know this lines me up for other stuff but I haven’t been thinking about it because I don’t want to get overwhelmed as I am really focused about doing this job. "We’ll talk about it after this fight and see what is next." Whatever the future holds, Harvey will keep on fighting for herself, her 12-year-old son Tyler, and her general wellness, as boxing will continue to act as the tonic to treat her well-managed depression. "I fight for my own personal reasons, my own demons that tell me ‘you’re not good enough’. "I box to shut that up, to get confidence for myself. When I win a fight, I get confidence that I don’t get from anything else. Nothing else can give you that and I get it from boxing. "I don’t care who the opponent is, it’s a fight with myself. If I lose, I take the hit and if I win, I take the glory. "If I was to slip now, I still have depression but it is just that it is under control"
"Depression is not a huge issue now because it is managed, I am so clean living – I might drink twice a year, I look after myself, exercise a lot and take a lot of vitamins so the depression doesn’t really rear its head, at the moment. "If I was to slip now, I still have depression but it is just that it is under control. "You have to be clean living for boxing, you have to eat right, you have to exercise and you have to cut out alcohol, and they are the exact things you have to do to combat depression." Harvey, however, is more than aware that her time is limited in the professional game and she admits that she will be out of this most demanding of sports in two years’ time. No stranger to the spotlight, Harvey actually appeared on the Irish television dating show, First Dates, a few years back. And while she concedes that she only went on it to gain publicity having recently turned professional, there is certainly a suggestion that she might be willing to sign up for a re-match once the gloves are hung up for the final time, as the bell tolls for her 40th birthday. "I had no interest in a relationship, I had just turned pro and it was more about putting myself out there and getting some publicity. "But I might be ready to settle down after I finish boxing. I might go back on the show, if they’ll let me."